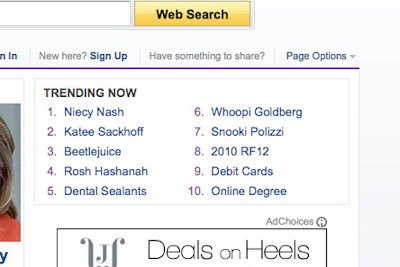 Come on folks, you’re telling me that at one particular moment in time these were among the top ten things people were looking for on Yahoo? Niecy Nash? Dental Sealants? Bettlejuice? Snooki, Whoopi Goldberg and Online Degrees? We can do better than this! I hope “online degrees” is there because as a collective a bunch of you realized you were spending your time looking up the 3rd hottest chick on Battlestar Galactica and the mouth breather Snooki and decided y’all needed to do something different with your lives!